If you were to name the director best suited to capture the musicality and authenticity of Rock n' Roll Hall of Famer Neil Young, thoughts would not immediately turn to the man responsible for The Silence of the Lambs. Yet Jonathan Demme has directed three terrific Neil Young concert films, each one presenting the singer's recent and vintage works in differing visual contexts. 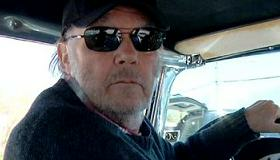 In Neil Young Journeys, the third and most stripped down of the lot, Young hops into a 1956 Crown Victoria and drives from his hometown of Omemee, Ontario to Toronto's Massey Hall where he performs a solo concert in support of his 2010 collection of feedback confessionals, Le Noise. Fans of the 66-year-old guitar god (which is to say the only people who'll see this homespun gem) will revel in Young's winsome cruise down Memory Lane. Ancillary is where Neil Young Journeys will reap the inevitably small financial windfall that awaits it. However, a trip to the big city multiplex could result in orgiastic levels of sonic bliss, as selected theaters are presenting the songs at double the normal sampling rate traditionally employed in movie houses. It really is something to hear, like being engulfed by angry, slashing waves of beautiful noise. Young is a true master of the six-string cri de coeur and the Massey Hall concert (recorded May 2011) shows us the grizzled singer at his angry and plaintive best. Classics like After the Gold Rush and My, My, Hey, Hey (Out of the Blue) spark to life, augmented by Demme's use of close-ups and minimal edits. Like the best guitarists, Young coaxes a full range of emotions from his axe, while his voice, indelible and imperfect, has only gained power and depth with age. If nothing else, the film is a testament to the continued emotional and social relevance of his work as well as his career longevity. Young's been a force in rock for over 45 years and by pairing 1969's murderous Down by the River with 2010's romantic Sign of Love, Demme ably drives home that point while also daring to argue that the old man may finally be mellowing. In Demme and Young's first concert documentary, the beautiful Neil Young: Heart of Gold (2006), the performances were staged for the cameras. Their next doc, Neil Young Trunk Show (2010), was the opposite as Demme's crew shot an existing stage production with almost no allowances made for the camera. Neil Young Journeys may feature an uncharacteristically high-concept entry point, but it's impossible for Young to do anything that doesn't feel completely genuine. As he drives down the highways of Ontario, his brother Bob in the car ahead, Young spins youthful tales of catching fish, sleeping in pup tents and eating tar. He makes for a gentle, cool-uncle tour guide, sweet and poignant without being maudlin or self-eulogizing. Inside Massey Hall, Demme plays it mostly simple. Visual flourishes like split screens and family movies seem intended to trigger wistful memories in Young himself. Late in the doc, DP Declan Quinn's camera moves higher into the crowd. Otherwise it stays at close and medium lengths, with the notable exception of a camera mounted on Young's microphone, resulting in a shot that stands within TMI-proximity of his mouth. During Hitchhiker, a drop of spit actually hits the tiny camera lens. Demme stays on the shot anyway, adding a psychedelic layer to the 70s era composition that remained unreleased until Le Noise. At this point in this life, the Toronto-born legend wouldn't be blamed for cashing in and embarking on a greatest-hits victory lap. Young, though, is far from done. He remains a vibrant and restless explorer of his own emotional state. Since his earliest days in Buffalo Springfield, Young has stayed true to an artistic vision that combines relentless musical integrity with blatantly personal storytelling. Demme, whose 1984 Talking Heads documentary Stop Making Sense is a classic roc-doc, surely sees in Young the rawness and honesty that are hallmarks of all great rock artists. Of the major film directors, only Martin Scorsese has shown such a consistent interest and obvious knack for the genre. Scorsese's approach has always been contrary to Demme's. Scorsese docs like, The Last Waltz and Shine a Light, feel bigger and more epochal, while Demme's are small and personal. One is not intrinsically better than the other. But only one is right for Neil Young.